There are a diverse number of exercises to help physically develop the body. Most of these are well designed, user friendly and can be utilised effectively in your training program. A number of these however remain exercises to avoid, because they will inevitably cause injury at some point down the line. This article highlights five exercises to avoid. This knowledge should potentially help enable you to avoid months of injury and pain. Many individuals claim to be able to perform this move without a problem, however behind-the-neck presses remain one of the exercises to avoid, and will wreck the shoulders if performed too regularly or for too long. You may be ok in the short term but after a few years or more you will feel its debilitating effects in one form or another. The behind-the-neck press places the shoulder joint under load in an externally rotated position, on the limit of its range. This places it in a very vulnerable position, and puts excessive strain on the rotator cuff muscles. The majority of people do not have the necessary shoulder flexibility to effectively perform this movement. Additionally the head has to be tilted forward to accommodate the movement of the bar. This increases the potential for injury. Another of the exercises to avoid, not only is it inherently unsafe, research shows that it activates less lat recruitment, and is therefore less effective, than pulldowns from the front. Similarly to the behind neck press, this movement involves the shoulder in an unnaturally externally rotated position. Additionally it is also in a position of horizontal abduction. As a consequence stress is placed on the rotator cuff, forcing them to to work harder to stabilise the joint. This makes them vulnerable to injury. 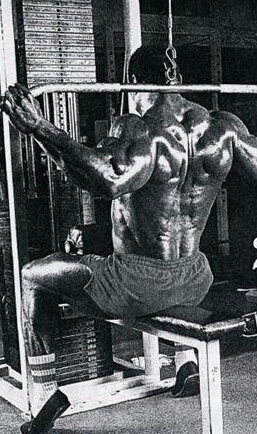 As with behind-the-neck presses, behind-the-neck-pulldowns require the individual to jut their head forward to provide a clear path for the bar towards the base of the neck. A forward head posture can promote muscular tightness of several large neck muscles (i.e., sternocleidomastoid, levator scapulae, scalenes). A forward head posture has also been implicated in neck injury. There is absolutely no reason to do these, especially given the fact that there are better and safer alternatives. If you must do pulldowns do them from the front. Pull ups, or chins however are overall a far more effective alternative. This unfortunately remains a popular movement for building the medial deltoids and trapezius muscles. The straight bar is pulled upwards with the shoulder internally rotated under load. When pulled up to the neck this causes the tendon to be pinched, which over time will cause an impingement injury. Additionally the narrow grip, plus straight bar, places excessive strain on the wrists. This is inadvisable as an exercise movement for a number of reasons. This movement is especially dangerous when done under load, which is a common method employed . Trainees can be seen with their training partner loading their lap with plates as they perform the movement. This exercise puts your hands back behind you at the bottom of the rep. The shoulder is very weak and compromised in this position. In the other form of dip (parallel bar dip), the hands are never behind, so the shoulders are in a much safer position. Replace bench dips with parallel bar dips (preferably weighted) or narrow grip bench press. These are far safer and additionally superior for building the triceps. 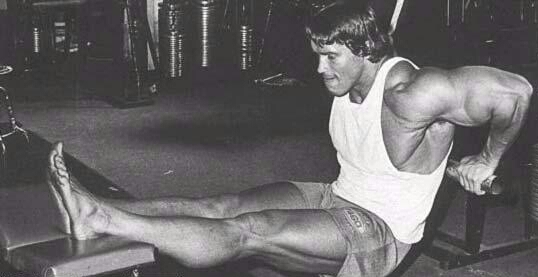 Even Arnold was guilty of performing this heinous move. The Smith machine has a bad reputation amongst seasoned trainers, much of it for good reason. It has its uses but replacing the squat rack is not one of them. There is an old ex – shot putter in the gym where I train, who told me he had sustained a bad back so could not squat with a barbell. So he used the Smith machine instead! I explained to him that squatting on the Smith Machine will likely do more damage to his back. The movement places undue load on the spine because it forces the body to follow a straight up and down path, rather than the arc which is the natural squat path. Additionally much of the bodies musculature is not used when working on the Smith machine. The stabiliser muscles for example are not recruited. If you desire to remain injury free, avoid utilising any of the above exercises in your training program. Additionally always aim to perform all resistance training exercises with a neutral cervical spine posture.